Guinness have extended their recently launched 'Bring It To Life' campaign through the launch of a Bring It To Life partnership with Google Earth. 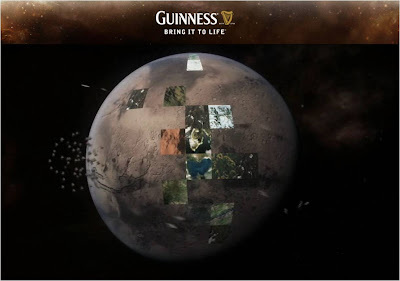 At Guinness.com users are encouraged to participate and are offered the chance to 'Bring Your Own World To Life With Google Earth'. Visitors can use customised Google Earth technology to create their own planet, then 'Bring It To Life' by selecting terrains and designs for the planets' landscape. Facebook integration allows creations to be shared with Facebook friends and Facebook friends can be invited to co-create and participate in the development of Bring It To Life planets. Guinness 'Tipping Point' and the Pot Noodle 'Tipping Pot' viral follow up!